Join your hosts as they valiantly try to figure out what the hell is going on in this deadliest of spas while being distracted by familiar faces, snacks, and questionable fashion choices. So many questionable fashion choices. Killing a podcaster's patience, one ill-concieved flash-back at a time. From December 25th through Jan 5th, the world celebrates the 12 Days of Christmas with Saints, carols, and a song featuring a LOT of presents. But the Women In Caskets have their own twisted version of the holiday. 12 Days. 1 - No, 2 - Holiday Horror Movies. Dawn's Last Nerve. Welcome to the annual 12 Days of So You Don't Have To. This year featuring the, ahem, classic, Silent Night, Deadly Night - and eventually its sequel. Because there's so much not there, we had to go find more to pad out the runtime. And regretted it immediately. Someone should be PUNISHED. Here is a lovely master post so you can find all twelve episodes in one easy place. Intro: Dance of the Sugar Plumb Fairy by Millstones (Electrohouse Remix) by millstones. The marine biology is all wrong, the dolphins are smarter than the humans, and the control room is from an entirely different movie, but all of that pales in comparison to awful, terrible, and absolute BOREDOM experienced by Jen and Dawn as they're forced to watch Jaws 3D (in 2D). Spoilers: It's actually Jurassic Park at Sea World. No really. It totally is. The Women In Caskets would like to extend the most heartfelt of thanks to Preston, who paid for this episode by donating to our Patreon. Preston, we never would have done this without you. Seriously, we never would have seen this if you hadn't forced our hand. Jurassic Park and Original Jaws theme by John Williams, Jaws 3 themes by Alan Parker. Fish Heads by Barnes & Barnes. It is a sad, sad, no-good, absolutely terrible day when Dawn realizes she did more research for a podcast than the writers did for their movie. Saddled with a fundamental lack of understanding, 2006's Stay Alive is Exhibit A for the case against Hollywood ever managing to make a decent video game movie. Technical errors, gamer tropes and mechanics that can't stay consistent from one scene to the next, this film manages to fail on just about every level imaginable. And Dawn's gonna tell you all about it. And a huge shout-out to Dawn's favorite gaming critics, analysts and historians, the crew at Extra Credits. Check out their You Tube Channel HERE. We are now available in iTunes, Google Play, Stitcher, and all your favorite podcatchers. Click on the links, or get our RSS feed on Soundcloud! Please rate and review us, we love to hear from you all. Sadly, this more or less sums up most of the movie. The writers snarling at stereotypes. Let's be concise this year, shall we? One SYDHT post to rule them all? After all, there's a lot of truly offensive jokes, terrible puns, nonsensical plot devices and only two bright stars to get us through the night. Join Dawn on her annual tour through a holiday-themed mess of a movie. 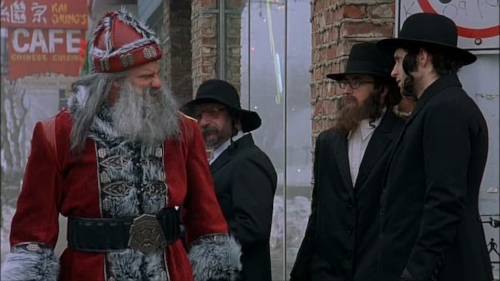 From initial amusement, incredulous stammering, and finally, an exhausted final gasp, this year's movie, 2005's Santa's Slay, truly has something to tick off everyone. On the twelth day of Christmas, this movie gave to me: Twelve hunters hunting, eleven seconds of zamboni, ten bulging muscles, nine townies fleeing, eight missing evil elves, seven tasteless cheap jokes, six pretty puppets. Five very dead strippers! Four random plot points, three damn door locks, two teen stars, and a very dead WASP-y family. This is it. This is the end. The whole thing. Our Patreon is live! Come check us out at www.patreon.com/womenincaskets! We are now available in iTunes, Google Play and Stitcher!